And the girl once again remembered the feel of warm skin, the sweet breath of laughter. And the loss was so deep, so intense that she felt a deep hatred boil inside her chest for those who had cast her out that morning, severing her from the only place she regarded as home. As the first drops of the elixir touched her tongue, her desire was not love. Ghosts are like secrets. You may not always be able to see them, but they linger, always present, always influencing those around them. Shilpa Agarwal's novel, Haunting Bombay, tells the story of the Mittal family, three generations living under the same roof. Secrets cannot be hidden forever. And the dark family secret in the Mittal household would soon be let loose by the unbolting of a door by an innocent girl. Pinky is thirteen years old. The year is 1960. She never knew her mother, a refugee who died during the Partition. Pinky was taken in by her loving grandmother, Maji. The two live with Maji’s only son, his wife and their three sons. Pinky has never understood why the door to the children’s bathing area is bolted every night. One night, in the heat of despair, Pinky dares to unlock the door and it unleashes the ghost of a baby once drowned, who is now set on vengeance. A family, that by all appearances on the outside is healthy and happy, suddenly begins to disintegrate, proving just how fragile their bonds truly were. Pinky’s uncle for years has turned to alcohol to soothe his suffering. His wife longs for the upper hand, always wanting to be the best among her friends and family, and will do just about anything to get her way. Seventeen-year-old Nimish moons for the neighbor girl while Pinky pines for him. Then there are the twins, one with a sweet tooth and the other a bit of a trouble maker. The four servants in the house have their own stories: two sisters having fled famine and worse in their childhood; the driver from the slums; and the cook, a man of honor who is devoted to his wife. Maji seems to be the one person who is holding the family together, but as her control slips, and as the family’s secrets begin to surface, they risk losing everything. Pinky is at the core of it all, and she is determined to uncover the truth in order to save her family. Shilpa Agarwal reaches into her own family history to help shape her fictional tale, offering the reader a glimpse into a family’s darkest and also strongest moments. It was easy to get lost in the story and feel like a part of the family. I was especially drawn to Pinky, so innocent and yet courageous. She may not have known her place in the household, but she certainly knows her own mind. I was also partial to Nimish, always lost in his books. He may not have been the strongest character, but he loved deeply. The heat before the monsoons and then the coming of the harsh rain mirrored the events taking place in the novel: a seemingly peaceful existence suddenly uprooted by the storms. The author brings Bombay to life, offering a taste of Indian culture as she takes the reader into an upper class Indian family as well as deep into the city’s underbelly, where crime runs rampant. The reader gets a sense of the injustices that existed during that time period, including the corruption and prejudices. The magical aspects of the story are interwoven into the family’s tragedy seamlessly. In the author’s guest post here at Musings of a Bookish Kitty, Shilpa Agarwal mentions that the spirits are “a metaphor for those who have been silenced.” In Haunting Bombay, the ghosts have no voice and are often invisible; however, they can only be ignored for so long. The ghosts, like the Mittal family’s secrets, will come out and be heard or they will destroy all those who suppress them. Haunting Bombay lives up to its title. It is a haunting tale full of mystery, forbidden love, dark secrets, and mysticism. Shilpa Agarwal’s writing is beautiful, her story intense. I fell in love with this novel on the very first page and that feeling never wavered. If anything, it grew with each turn of the page. There was so much I liked about this novel; so much I haven’t said. Do you have a day or two? 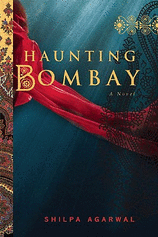 Haunting Bombay would make a great book club selection. You can learn more about Shilpa Agarwal and her book Haunting Bombay on her website. Be sure and check the TLC Tour stops for a list of Shilpa Agarwal's tour stops! This is one book I need to read. Thanks for the great review, Wendy! OK, I am losing my mind, I thought you had already reviewed this! That is what happens to me on tours. I forget where I read reviews. Anyway, the guest post was awesome and so is your review. It is a great book to read this time of year (and for RIP). I like good ghost stories, and how cool is it that you learn about India? But the author's insight the other day even adds more appeal to the book. This sounds like a complex and interesting read. Great review. This one is definitely on my radar. I love the cover too. Thanks, Wendy! You aroused my curiosity by hosting the author, then followed with a great review that makes sure the book goes on my TBR list! Wendy, you always have great insights into books that I don't think I would have caught on my own. For example, "The heat before the monsoons and then the coming of the harsh rain mirrored the events taking place in the novel: a seemingly peaceful existence suddenly uprooted by the storms." I don't think I would have noticed that, but what a great observation! I've been following the reviews on this tour, but yours is the one that's put this book on my wishlist. Thanks, Wendy! I have just started seeing this book around the block and it sounds totally awesome. This is one that I will be looking out for in the future!! What a wonderful review! This is definitely going on my TBR list. There are lots of ghost stories out right now...I just finished Her Fearful Symmetry and The Little Stranger, so I might have to take a break from the ghosties. But this one does sound interesting, especially for its setting. Melody - Thank you, Melody! There were many wonderful elements in this novel. Alice - I hope you do get a chance, Alice! It was so good. Had I not already read this book, the guest post would definitely have made me want to. Nicole - I think the cover is great too. It's definitely a novel with many layers. Jenclair - I do hope you'll give this one a try! Trish - You're so sweet to say that, Trish. Thank you. And thanks for letting me a part of this tour! Florinda - Thank you. I hope you will enjoy it. I'm so behind with my Google Reader that I've read so few reviews yet of this one. Staci - I am so glad I read it. I hope you will like it if you read it. Carrie - Thank you, Carrie. I do hope you are able to read this one. I'd love to know what you think. Your review definitely makes me want to add this one to my TBR list...which I just did! This sounds like such a beautiful, haunting read. There's something about encountering monsoons in a book - it's very evocative. Oh good analogy! Ghosts are a lot like secrets. Sounds like an intersting story. Glad you enjoyed it! Kathleen - I hope you will enjoy it, Kathleen, if you read it! Belle - I really thought it was. The monsoons really helped set the mood. Jen - It really is an interesting story. I'm so glad I read it. Beautiful review Wendy. You have such a way with words that portrays the book in the best light. I too loved this novel. It's one I could see myself reading again someday. Dar - Thank you, Dar. There wasn't a thing about this book I didn't like (other than maybe the fact that it ended). I was thinking the same thing, that I would want to read this one again someday. Great review! This sounds really good. There is something about the cover that captivates me too. It's so simple, yet has a certain quality about it. April - I really like the cover too. I especially like the colors. I've read so many great books this year, looking back so far. Great review, Wendy! I love books set in India and I like that this one seems to have a bit of magical realism too! Iliana - Thanks! Yes, there definitely was magical realism in Haunting Bombay. I loved the ghost story in this one! I keep recommending this novel. I really loved it. It is hauntingly beautiful. Serena - Yes! It was such a good book. I can't stop talking about it either.